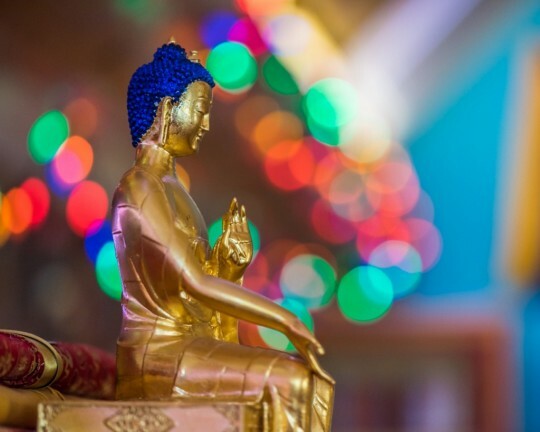 One of hundreds of buddha statues in Lama Zopa Rinopche’s altar room at Buddha Amitabha Pure Land, Washington, US, July 2015. Photo by Chris Majors. I’m doing my best for my parents and family at this juncture, but we’re going through a very difficult time now. My dad’s business failed and has since chalked up a huge debt. He can’t afford to pay the debt; anytime now, once the bank seizes the property, we’ll be homeless. They are already in their late 60s, turning 70. I don’t think they can face the failure and take it in stride. I’m so sad and stressed out that I can’t do much for them. I’m watching over them for fear that they have suicidal thoughts. I got your emails. If you tell your father that there is no need to commit suicide, that I dedicate all my merits to him and to the family, that’s like money, good karma, good luck. He should read, if he can, the Vajra Cutter Sutra three times. Also, I have made prayers. If you can, pass that message to your father, even though he doesn’t like Buddhism or Buddhists. But just pass along the message. Courage is so important. Committing suicide when some problem comes and you don’t know how to deal with it comes from mental exaggeration. That’s a very ignorant thought that does not think about the next life, that does not allow one to think of the next life. There is continuation of consciousness. Even though the body stops, there’s a continuation of consciousness. Because we are born with suffering, that means there was life before this one. There was life before and this is the result of that life. There was suffering then, so there is suffering now. If the previous life were free from suffering, the oceans of samsaric suffering and their causes – delusion and karma – then in this life there would be no suffering, only ultimate happiness. So the suffering from beginningless lives goes back like this. If it’s 100 percent certain you are going to go to a pure land or even a perfect human rebirth in the next life, it’s okay to die. But mostly we go to the hells, hungry ghost realm, or animal realm. The suffering there would be the greatest suffering. For example, compared to one small spark of hell fire – to describe how hot it is if it were up here – the entirety of fire from the human world put together, that hotness, is like falling snow or air conditioning. This is just an example of lower realm suffering, especially the hells. Wow, wow, wow, wow; you can’t imagine, you can’t imagine; you can’t imagine. How unbelievable it would be if you were born not in a major hell, but in a secondary one, the hell realm in lava. So committing suicide is like deceiving yourself to immediately join with the heaviest suffering of the hells after this life. This life – even if you have those failures that are believed in in the West, that are made so much by attachment and delusion – is incredible peace. Committing suicide is like completely deceiving yourself with ignorance. Whenever suicidal thoughts come, the remedy is to think of reincarnation, the continuation of life.